Mitsubishi Motors Corp has slashed the price of its first generation electric kei-car the i-MiEV in Japan by up to $9,100. With government subsidies, the model can be bought in Japan for around 2 million yen, it said (AUD$ 21,500). "The main purpose of cutting the price is to strengthen our ability to sell these cars," a Mitsubishi Motors spokesman said. 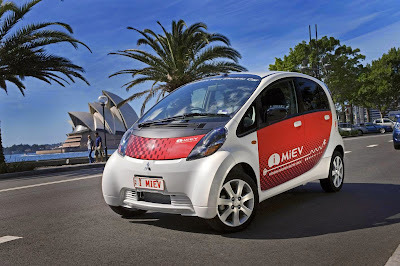 Mitsubishi Motors also cut the price of the entry level i-MiEV by 190,000 yen to 2.5 million, which with subsidies can be bought for about 1.7 million yen (AUD$ 18,250). In just over four years since the vehicle first went on sale, Mitsubishi has manufactured some 30,000 i-MiEVs. The car was rebadged and sold by PSA Peugeot Citroen as the iOn and the C-Zero. Mitsubishi is still betting on the electric powertrain technology and is aiming for electric vehicles and plug-in hybrids to account for 20 percent of the vehicles it produces by 2020. Mitsubishi and Nissan Motor Co recently announced plans to expand a joint venture to develop a new small car including an electric version. Nissan, maker of the Leaf electric car, also said on Thursday it would start selling its second all-electric vehicle, a commercial van called the e-NV200, in Japan in the financial year through March 2015.